Jack Ziebell leads the Kangaroos off Etihad Stadium after the loss. 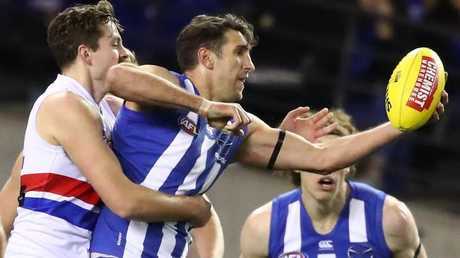 BRAD Scott says he won't spend any time pondering the permutations that could keep North Melbourne's finals hopes alive after a shock fade-out put a top-eight spot in jeopardy. 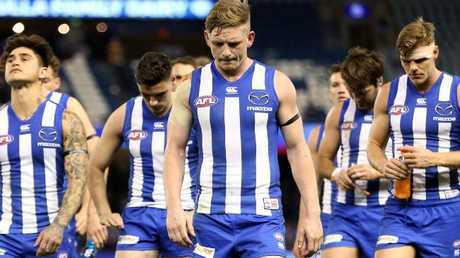 The Kangaroos led by 28 points at half-time against the Bulldogs on Sunday but as Scott said post-match, a "horror 30 minutes" saw the Dogs pour on 8.2 in the third term. The Dogs eventually hung on by seven points in yet another thriller between these two teams, meaning the Roos are stuck on 11 wins. They have to beat Adelaide away and St Kilda at home and have a host of results tumble their way to have any chance of leapfrogging rivals into September. Key forward Jarrad Waite will likely be fined after bumping Jackson Trengove high after a marking contest, with the hit likely careless and low impact. A terse Scott said post-match he wouldn't spend a minute on the ladder predictor, in contrast to twin brother Chris Scott's assertion he has repeatedly done the numbers on Geelong's finals hopes. Asked if it was one of his most frustrating days in coaching, Scott replied: "Not really, just another day at the office". "We did a lot right in the game and had a horror 30 minutes. The Dogs kicked five goals in a row in the third quarter and eight goals to one. "It is an interesting psychology when a team can't play finals and are five goals down at half time. It's like, let's roll the dice. "But they won the ball in the contest and we couldn't get our hands on it and we couldn't defend it when they won it." He denied his side had tightened up in the second half with so much on the line, adamant the team's goal this year was to improve. "I didn't detect that. We were a bit stagnant with our ball use," he said. He said the Roos could still play finals but the ultimate goal this season was to build into a team that could consistently beat top eight teams. "It depends on the results. You guys, I promise, spend so much more time looking at it than I do. I don't even look at it. I don't sit down with the ladder predictor. I just work really hard on us trying to become a good team," he said. 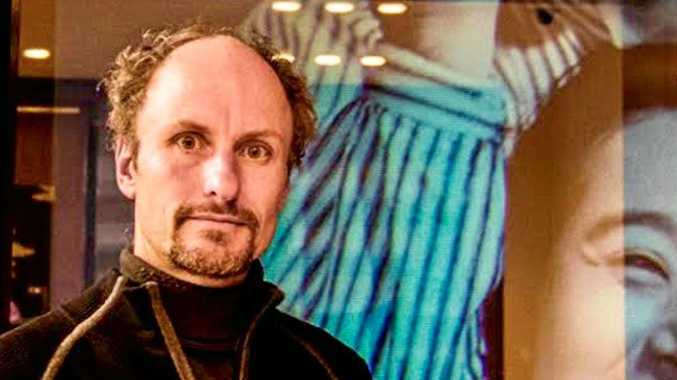 "The message has been really clear and consistent from the start of the year. It's about how we look to improve and be a competitive team. "And not get too caught up in where people think you are. We have brought players on that have been revelations. "We want to be competitive against the better teams and we are still not there yet." Majak Daw was superb with four contested marks and Ben Brown is now tied with Jack Riewoldt in the Coleman Medal race but the Roos were smashed in close. The Dogs won the clearances 39-27 and had 90 more uncontested possessions as they held sway after winning the ball in close.